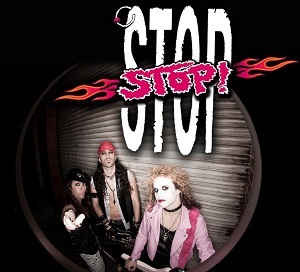 Stop Stop are a glam rock/hard rock band that are orignally from Spain, but moved to London last year. They've been busy touring and building a good fan base in the UK. "Unlimited" is their debut album, and I have to say it's an impressive debut, and certainly lives up to their excellent live reputation. This is definitely a band to watch out for if they're playing a festival or gig near you. The album opens with "Born to rock" with its chunky guitar riffs and rapid pace. The vocals are certainly reminiscent of Michael Monroe - which is certainly no bad thing. It's a great heavy rock which I can imagine being great live. "Regret" really does feel like a Hanoi Rocks song and is another great song. In fact there isn't a weak song on the album - it's a really good album, and one that has a good fun glam rock feel to it. If you're a fan of Hanoi Rocks then this is definitely an album you should check out - Stop Stop have a great sound that has a lot of that Hanoi ROcks feel to it, particularly with the vocals, and this is a great album.